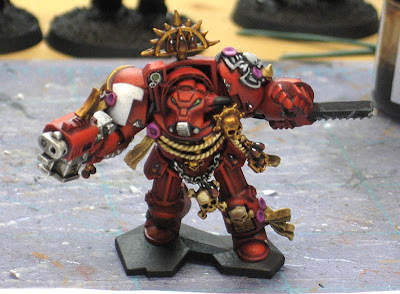 Thought I might share some of the Blood Angel Terminators I've managed to finish recently. 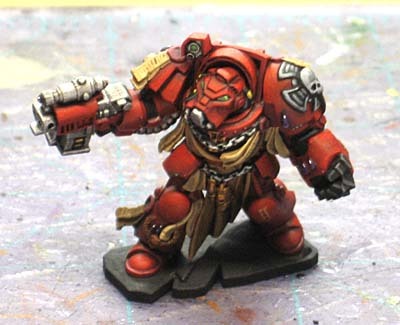 I've only got six of the twelve done so far, but I find myself really wanting to start a Blood Angels army these days. I think the red comes out really well on these guys and the models just pop on the tabletop. Add to it that they're fairly good sculpts (for models in a board game) with lots of detail and they just look cool. I've got 6 more of these guys to go and I'm doing my best to match the paintjob GW gave them when they were introduced in White Dwarf a few months ago. Those are fantastic. Some day I'll get to paint mine... Once life stops throwing me curve balls. whats the recipe for the red? The look great, so clean and smooth. How do you do your reds for these? 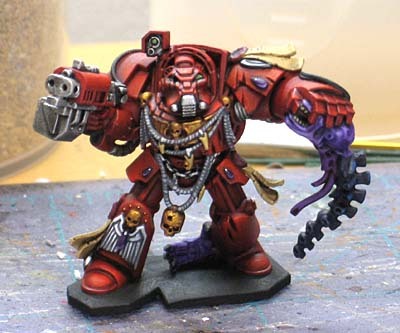 In my allies I was going to have 2 squads of Blood Angel Terminators (funny that as there are almost that many Termies in the Space Hulk box) but I'm definitely going to expand this to include some of the great sculpts from the new range. I'd love to see you create an army and show the stages on here! lol, I just started painting my Space Hulk termies in honor of the new codex. Everyone want to know the recipe for rich red? About a million painfully thin coats of Blood Red (I just talked about it on my own blog.) Seriously, keep the coats thin enough that they won't dry with texture and after 6 or 7 it should be looking pretty good. Nice work Ron. I'm not keen on the gray vertical edge highlights on the black shoulder in pic #1 though... they seem out of place. Everything else is top notch, like pretty much all your work. 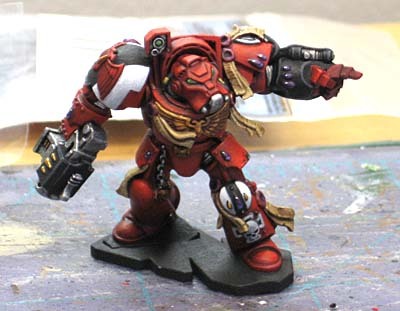 Army Painter makes a blood red primer (and this month they are releasing a deeper red primer). When I start another termie, I'll take pictures of him step by step. It's fairly simple (and quick) to do really, it just requires certain paints and GW washes. Great job, I really like the stealer's head. Very nice. 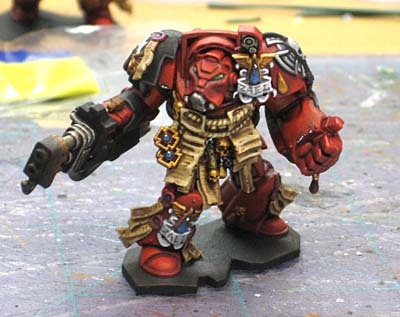 I just saw the Grey Knight Termies you sold to Chambers last week and I was very impressed with them too. 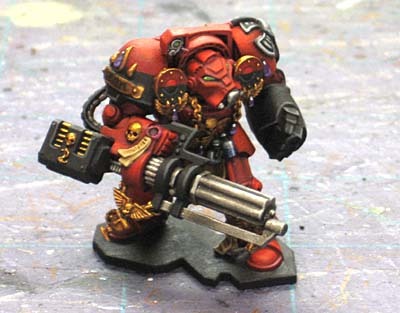 I love the look of those... of late Blood Angels have been calling out to me and I haven't had an interest in them since 2nd edition! Wow !! They look totally amazing ! 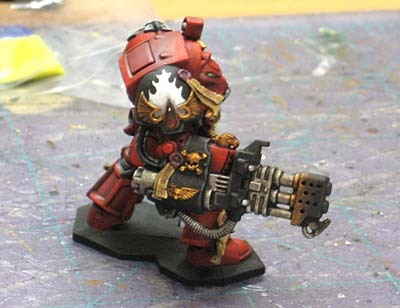 I really like how the armour turned out, red is very nicely blended there. Overall, the minis look great.